Two days, two cities, two cafes. Husb and I went to the Marina Market in Swansea today, a lovely day, cold and crisp but sunny. There was also a Preloved Fair at the adjacent National Industrial and Maritime Museum too. It was very busy and felt for the first time that winter might be lifting. Chilled, we popped into the Museum’s excellent cafe and had pots of tea. Lovely. 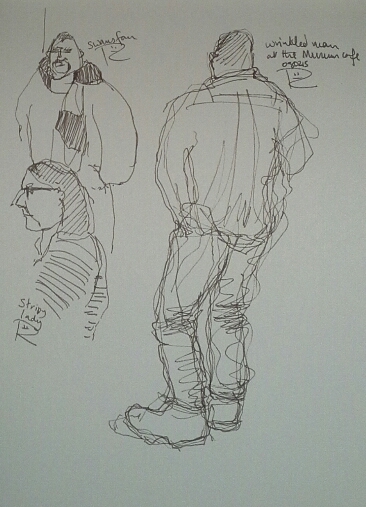 I did some speedy scribbles into my A5 Tate Gallery sketchbook with Faber Castell Pitt drawing pens, sizes S and F.The chap with his back to me was wearing very wrinkled clothes. Not unironed, just baggy and wrinkly. Then there was a large man by the counter wearing a black and white Swansea F.C. scarf. All scribbled in a couple of minutes. Forces you to focus on what’s really necessary.